B/w laser photocopy of photo of a group of people baiting lines at Embo. Man standing at left, boy standing, two women and two men sitting in front of a tall fence with a basket and bucket in front of them, and another woman standing and holding something that could be seaweed. 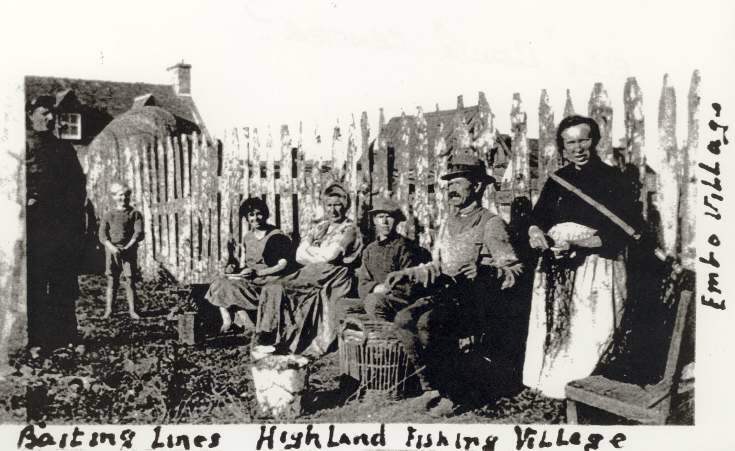 Caption at bottom "Baiting Lines Highland Fishing Village" and on right side "Embo Village". On reverse: " Elsie "Gallie" centre?". Quality of copy is poor. On same sheet as 2007.181.04. Elsie "Gallie" was the mother of Iris Bonthrone(nee Fraser) 9 Terrace street Embo. There is a remarkable resemblance between Elsie in the photo and Iris as she is now. I too knew Elsie aigh Gallie as the mother of Alastair, George and Iris Fraser of 9 Terrace Street, Embo. That being so this photo could not have been taken in 1890 as Elsie was only born in the early 1900s. This photo must have been taken in the late 1920s. Can someone not identify the other people in the photo? The boy and the woman sitting next to Elsie look so familiar but I can't put names to them. Sorry can’t help with who the other people are ~ Many thanks for your comment and for confirming the identity of Jessie. ~ Administrator. This could not have been my mother (Elsie Gallie) - as she was born in 1913 and died in 1970 aged 57 years old. My Aunt Jessie (Gallie) lived at 2 Terrace Street, Embo - and she always talked about the fishing, and how hard it was - but she was born in 1900 and died in 1980 (aged 80 years old). You are right John, everyone says I look a lot like my Aunt Jessie, and as she had no children, spent my childhood between No 11 and No 2 Terrace Street. Must be a relative, as resembles more my Aunt Jessie than my mother. ~ Thank you. ~ Administrator. Great photo. Jessie and Elsie were my aunts. Their brother, my father, was Sinclair Mackay. Born 1910 and died 1990. Realise our ‘by’ name was Gallie. Why? I have just started researching our family history. It is a bit confusing with so many Mackays and Frasers. Good to see Iris’s comments. It was good to see her 3 years ago. I recall Auntie Jessie preparing and packing to go off to Yarmouth. ~ Many thanks for your comment. ~ Administrator. I have given some thought as to who why Elsie and Jessie had the by name Gallie. I remember that that Elsie's elder son was Alastair and that we used to call him Allie or Fratie. It is quite possible that Elsie and Jessie's dad was also an Alastair and that he too was nicknamed Allie. So they became Elsie and Jessie aigh Allie.